Russell Finex manufactures one of the most cost-effective solutions for any screening requirement. 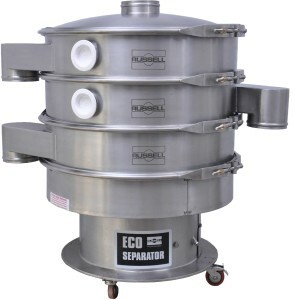 The Eco Separator® is an industrial gyro screen used widely in almost all processing industries including pharmaceutical, chemicals, plastics and food. This gyratory vibrating separator has the ability to separate materials on up to five fractions. The Russell’s spring-mounted gyro sifter can be installed in any size of production plant from small scale units to high volume production plants. This gyratory screen separator is manufactured in six standard sizes ranging from 24″ to 72″, matching the requirements of various applications. Contact us and request a quote or more information about the industrial sifting machine Russell Eco Separator®. This high performance gyro sifter, or vibro sifter separator, is engineered to handle all screening problems such as sieving, grading, separating, screening or scalping bulk materials. It can easily be installed into production lines, providing the best screening capacity without demanding excessive floor area. It has been designed to adjust easily allowing complete material control to optimize separation quality. Discharge outlets can also be moved around the machine giving greater flexibility in the positioning of collection bins or containers. Its modular nature segregates it from other models in terms of flexibility and optimum use of space. Options of a fully stainless steel base or painted base are available on this gyro sieve separator. This machine’s stainless base is ideal where there is a need to regularly wash down the machine or where painted equipment is not permitted. This is a common requirement within the food or pharmaceutical industries where a hygienic design is essential. A fully stainless steel unit with contact parts in 316 stainless steel is available to provide increased durability which is ideal for corrosive and aggressive environments. A wide range of gyro screens are available to suit your requirements (read more about: sieving machine manufacturers). The Russell gyro screen machine is more productive compared to conventional round vibro screen separators in terms of increased capacity, accuracy of screening, reduction in noise, loss of good product and production downtime. A standard motor is used rather than a vibratory type as it is easily available and less expensive than vibratory motors. It is designed to operate a continuous production line. Before making a purchase to ensure the best model is chosen according to your application a product trial can be conducted at the test facility of gyro screen manufacturer Russell Finex or at your own production plant. Contact us today and request more information about this vibrating screen machine and how it can help in your specific needs.